James L. Farmer, Jr., was born on January 12th, 1920, in Marshall, Texas. His father, James L. Farmer, Sr., was a preacher in the Methodist church (Grossman 69). With his wife Pearl he had three children, including James Jr., who was the middle child. The elder Farmer was a learned man; he was the first African American to earn the degree of Doctor of Philosophy in Texas (Jakoubek 6). In the same way, the younger Farmer was a quick and ambitious learner, and at the young age of 14 he entered Wiley College in Texas as a freshman. Growing up with segregation and racism all around him, Farmer wanted to fight the system that had repressed his family, friends, and fellow African-Americans for so long. He decided the best way to do this would be through ministry, and after graduating from Wiley he was accepted into Howard University, where he would study to become a minister (Grossman 69). While studying at Howard, he learned about Mohandas Gandhi and his belief in and practice of nonviolent resistance. Farmer came to believe that Gandhi’s approach could be one way to end segregation in the United States. While at Howard he joined in the Fellowship of Reconciliation (FOR), a group that aimed to attain social change through peaceful and nonviolent means (Sklansky 34). The idea of nonviolence was so important to him that he even spoke out against the United States joining in World War II (35). When he graduated from Howard in 1941, he decided the ministry was not right for him because of the discrimination that existed in the Methodist Church. Farmer once stated, “I did not see how I could honestly preach the gospel of Christ in a church that practiced discrimination.” He got a job at the Fellowship of Reconciliation and was sent around the country to preach the anti-war message (Jakoubek 11). In April of 1942, several members of the Fellowship of Reconciliation met in Chicago and formed a new organization called the Committee of Racial Equality (CORE); similar to FOR, the group practiced non-violent approaches to end segregation. Farmer was put in charge of CORE, and with the help of others he successfully garnered support from around the country where other CORE chapters sprang up (Jakoubek 12). Among other things in Chicago, Farmer led protests against restaurants that denied African-Americans entry. As the size of CORE grew, it changed its name to better describe the group, and the “C” was changed from Committee to Congress. Not everything was perfect, though; members who had ties to FOR were often at odds with Farmer and eventually all the fighting led to his resignation in 1944 (13). For the next decade or so Farmer worked in various positions, usually supporting people and groups that were marginalized. He worked at the NAACP for a brief time, but the organization’s mainly judicial focus was not what Farmer was seeking and he eventually left (Sklansky 71). Around 1961 CORE was having trouble with membership, and as an organization they went unnoticed by the popular press. They were seeking a new national director and they would call on Farmer to fill that position once again. Eager to get back into the program which he helped start, he quickly accepted and started to breathe new life into the organization (Grossman 69). Even though segregation in bus terminals and train stations was outlawed in 1960, the majority of the South chose to ignore the new law. This led to the creation of a protest called Freedom Rides, where volunteers would ride on the buses throughout the South and blatantly ignore the segregated signs of “whites only” and “colored.” As the CORE members moved farther south on the Freedom Ride, they began to sense the increasing tension of racism. On May 14th, 1961, a bus containing CORE riders was attacked in Alabama by a white mob armed with weapons (Sklansky 74). Eventually the mob set the bus on fire and as the passengers came off the bus they were beaten by the mob. When the bus arrived at Birmingham, the CORE riders again encountered hateful mobs that beat them with various weapons, and the assault left many seriously wounded (75). All these attacks on the Freedom Riders finally caught the attention of the federal government. The government intervened to help protect the rights of the peaceful protesters. People around the country were beginning to see the hate that existed in the South as photos and stories made it into the popular news. While Farmer was in Mississippi, he led a group of people into a white bus terminal and a Whites only restaurant. After refusing to leave, the group’s participants were arrested and placed in jail for six weeks in miserable conditions (Sklansky 77). For the next few years, Farmer would help put together protests and in 1966 he would step down as the leader of CORE (Jakoubek 27). In 1975 Farmer would help establish the Fund for an Open Society, a nonprofit company that gave low-interest mortgage loans to African-Americans in order to encourage integration into society. The next year he got a job with the Coalition of American Public Employees working for the rights of public workers (Sklansky 103). In 1985 he finished writing his autobiography, Lay Bare the Heart, and also began teaching at Mary Washington College in Fredericksburg, VA (now the University of Mary Washington) (Grossman 70). He was a Professor of History and American Studies up until his death in 1999. Even as he became older and began to lose his sight, he still taught the history of the Civil Rights movement to classes of students lucky enough to hear his amazing stories (Jakoubek 28). In 1998, a year before his death, Bill Clinton awarded him the Presidential Medal of Freedom. The work of James Farmer was integral in shaping the Civil Rights movement, and his legacy as a non-violent protester who helped work hard to realize the rights of African-Americans in the United States will not be soon forgotten. 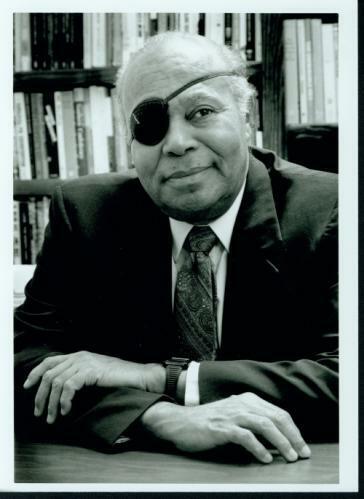 “James Farmer at His Desk,” University of Mary Washington Centennial Digital Image Archive, http://archive.umw.edu:8080/vital/access/manager/Repository/umw:32?collection=umw%3a2 (accessed April 22, 2008). 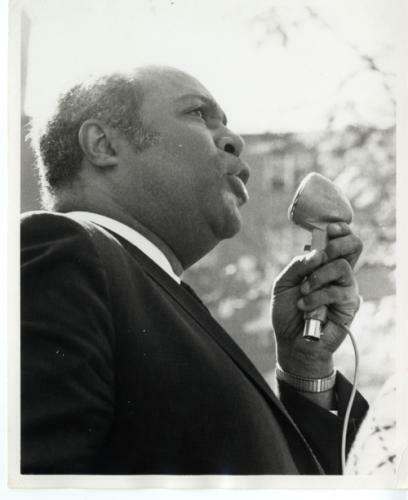 “James Farmer Campaign Speech,” University of Mary Washington Centennial Digital Image Archive, http://archive.umw.edu:8080/vital/access/HandleResolver/10154/10590 (accessed April 22, 2008). Eskew, Glenn T. But for Birmingham: The Local and National Movements in the Civil Rights Struggle. Chapel Hill, NC: University of North Carolina Press, 1997. Grossman, Mark. The Civil Rights Movement. Santa Barbara, CA: ABC-CLIO, Inc., 1993. Hampton, Henry, Steve Fayer, and Sarah Flynn. Voices of Freedom. New York: Bantam Books, 1990. Jakoubek, Robert E. James Farmer and the Freedom Riders. Brookfield, CT: The Millbrook Press, 1994. Sklansky, Jeff. James Farmer. New York: Chelsea House Publishing, 1992. Center for East Texas Studies. “James Leonard Farmer.” Stephen F. Austin State University. http://www.cets.sfasu.edu/Harrison/Farmer/farmhome.htm (accessed April 22, 2008). Fund for an Open Society. “OPEN’s History.” Fund for an Open Society. http://www.opensoc.org/aboutus/history.php (accessed April 22, 2008). James Farmer Multicultural Center. “Dr. James L. Farmer, Jr.” University of Mary Washington. http://www.umw.edu/multicultural/about_james_farmer/default.php (accessed April 22, 2008).The James Farmer Project. “The Life and Times of James L. Farmer Jr: Civil rights Leader and Distinguished Professor.” University of Mary Washington. http://jamesfarmer.umwblogs.org/ (accessed April 22, 2008). James Farmer Scholars Program. “Who is James Farmer?” University of Mary Washington. http://www.umw.edu/cas/jfscholars/who/default.php (accessed April 22, 2008). Severo, Richard. “Jim Farmer (January 12, 1920-July 9, 1999).” Congress of Racial Equality. http://www.core-online.org/History/james_farmer_bio.htm (accessed April 22, 2008).